A Spectacle Blind is a safety device used to isolate a section of line or piece of equipment when the line or equipment needs to be inspected or removed from service. It is different than a valve in that the Spectacle blind is a permanent or long term isolation device. Spectacle Blinds are more commonly installed as a permanent device, where one end allows pipe flow, and the other blocks the flow. Amiga Engineering™ Pty Ltd have been manufacturing Spectacle Blinds (also known as Spec Blinds or ‘8 Blind’) since establishment in 1988. Amiga Engineering™ are known for the superior quality of Spec Blinds. Our company products are Australian Made and are supported by local business, as Amiga Engineering™ supports local business. 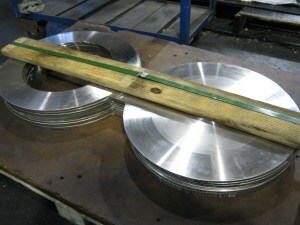 The materials more commonly used are Carbon, Stainless and Alloy steel – to suit customer requirements. These 8 off Spectacle Blinds are packed and ready for Delivery. Spectacle Blinds can be heavier than Paddle Blinds (Spades), where larger sizes require assisted lifting for installation. This is where Amiga Engineering™ provides Spades or Paddle Blinds for ease of positioning, installing and removing of product. Many large corporations and companies have utilized our company for our products for a vast range of projects. Our Australian Made Spectacle Blinds can be found on many applications around the country. Some past customers are not aware that we still manufacture Spectacle Blinds, so if you would like a free quote, don’t hesitate to contact us. Amiga Engineering™ also manufacture Spades (Paddle Blind) and Spacers to suit your applications. To find out more on Amiga Engineering’s Spades & Spacers, click here.